While 2011 saw a flurry of restaurant ribbon-cutting ceremonies, a more modest number of fine dining establishments opened in 2012. What the year has lacked in quantity, however, it has made up for in quality. Our picks for the Best New Restaurants of 2012 not only are the best of the year, but are also likely to stand the test of time and become South Florida icons. Picture a shot glass perched atop a mound of shaved ice. Within the glass is a colorful soup of shochu, ponzu and sriracha, a silver blue oyster and golden uni (raw sea urchin) garnished with tobico caviar and scallions. It’s almost too pretty to touch, but it’s down the hatch — and the sea and earth collide into one glorious dance on your tastebuds. Chef Clay Conley has done it again, as he continues to shake up Palm Beach with his distinct flair with flavors. The James Beard Award semifinalist and executive chef behind last year’s best new restaurant, būccan, has added another (award-winning) restaurant to his portfolio this year. Nestled in the space adjacent to būccan on South County Road in Palm Beach is Imoto, Conley’s version of a Japanese izakaya. Imoto, translated to mean “little sister,” continues būccan’s successful “small plate, big flavor” concept with Japanese and Asian-inspired cuisine. The menu is carefully balanced between tried-and-true sushi, sashimi and tempura dishes interspersed with Chef Conley’s innovative creations, all inspired by his time living and working in Japan. What sets Conley and his restaurants apart from — and ahead of — the rest is his emphasis on flavor. Each dish is carefully prepared to perfectly execute the delicate textures and tastes that exemplify this type of cuisine. If you stick to Conley’s signature dishes, your senses are in for a treat. After the delightfully balanced Wianno oyster shooter, wow yourself with the yellow-tail sashimi with grapefruit, avocado and toasted coconut and “mm mm” your way through the Peking duck tacos with plum sauce. Bring it all to a stunning crescendo with the tuna and fois gras slider with mango salsa. Feeling less adventurous? Even the California rolls are worth a drive here. While only seating 40, Imoto’s atmosphere is bright and energetic, even if the tables are close and cozy. Just keep a wary eye on your curious neighbors and their wandering chopsticks. The dearth of fine dining seafood restaurants in Palm Beach has been corrected considerably this year with the new PBCatch on Sunrise Avenue. PBCatch is not only beautifully decorated — with friendly, attentive service to match — but also features Chef Julien Gremaud’s delightful selection of fresh, local fish and such customer favorites as steak and chicken. But it’s the raw bar and fantastic happy hour specials that get our applause. The raw bar boasts a great selection of fresh oysters, clams, crab and shrimp while the happy hour from 4:30 to 6:30 p.m. Monday through Saturday not only offers $1 oysters, but two-for-one drink specials. Oysters and champers, anyone? Restaurateur Hamid Hashemi is no stranger to success, and his latest endeavor, Tanzy, in Boca Raton, provides more of the same. What we love about this artisanal Italian restaurant is its overall concept. Hashemi knows that dinner and a movie go hand in hand, as he is also the visionary behind the iPic theater concept now sweeping the nation. Situated on the lower level of the new iPic theater in Boca Raton’s Mizner Park, Tanzy caters to movie goers and foodies alike. 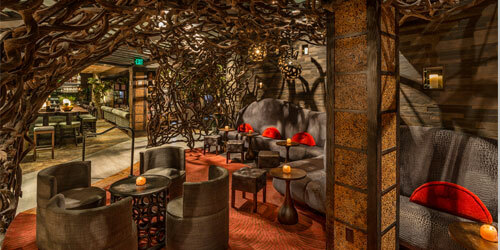 The decor hints at an enchanted forest, enhanced by unique textures and materials sourced from around the world. Executive Chef Angelo Morinelli emphasizes the freshest ingredients to execute each menu item to perfection. Much of the pasta is handmade, while the Parma Bar is a treat for anyone yearning for a taste of southern Italy’s cured meats, breads and mozzarella. House specialties include a stunning beef carpaccio, enhanced with a simple touch of truffle oil and balanced by lovely fried capers, lemon and organic arugula. Tanzy also features creative cocktails concocted by Adam Seger, the award-winning in-house mixologist and sommelier. Seger uses herbs from the bar’s own herb garden to bring a unique flavor to each drink. For those looking for dinner and a movie, Tanzy provides a romantic atmosphere and fine-dining experience. An express menu that includes cocktails is available to movie-goers at the upstairs iPic theater. Josef’s Table makes our list for its wholly satisfying and simply delicious Euro-fusion cuisine. Each dish takes its cue from Austrian-born Executive Chef Josef Schibanetz, who has cooked from Europe to South America. Based at the Polo Shoppes in Boca Raton, Josef’s Table features a menu stemming from Chef Josef’s Austro/Italian culinary roots that is sophisticated and contemporary, with a hint of nostalgia. Josef’s signature items include wild mushroom beef and barley soup, roasted maple-leaf duck, herb-crusted rack of lamb and, of course, wiener schnitzel. Pair any of these dishes with a fabulous bottle of wine selected by the in-house sommelier and top it off with the delicate apfel strudel topped with housemade ice cream, and, well, you just might have the urge to go into the kitchen and give Chef Josef a hug. This is comfort food, Boca style. There are more than a few Italian restaurants in South Florida, and many offer veal osso buco; but Ernie’s Italian Chophouse’s osso buco is causing a stir in Lighthouse Point. The twin baby veal shanks are slow roasted to juicy perfection and served with a perfectly textured risotto Milanese. But it’s not only the osso buco that gets rave reviews, it’s nearly the entire authentic Italian menu. From the warm, crusty bread served with olives and a dipping sauce to the black linguini with shrimp and crab meat, to the grilled octopus tossed in a limoncello vinaigrette and served with cannelloni beans, Ernie’s delivers on freshness and flavor. The pasta is made fresh daily, the fish is fresh and the chocolate cake is excellent. In a sea of Italian joints, Ernie’s stands out for serving the most memorable Italian food in the area — a rather commendable achievement for a newly opened restaurant. If you’ve ever spent time in the metropolises of France, you might be familiar with the popular chain restaurant Léon de Bruxelles and its delicious moules frites, prepared every which way and served in cast-iron pots. Here at home, Boca Raton residents are now enjoying mussels every which way — along with a casually elegant dining experience as only the French can do — courtesy of the new Stéphane’s. If those moules frites prepared provençal, Mumbai or American style — with bourbon, Virginia ham, corn, Golden’s mustard and crème fraiche — bring back memories, it may be a simple tribute to owner Stéphane Lang-Willar’s previous culinary success in Paris as the owner and operator of a Léon de Bruxelles. But Stéphane’s serves much more than mussels, offering such traditional and contemporary authentic French dishes as duck a l’orange served with potato cakes, carrot purée and cauliflower purée, Mediterranean sea bass with mushroom and rice pilaf, and a selection of pastas, salads and sandwiches. From the raw bar to the bouillabaisse, expertly paired with selections from the wine list created by master sommelier Virginia Philip, Stéphane’s is worth a drive for out-of-towners as well. Stumped on what to cook tonight? How about a juicy rotisserie chicken, vanilla crème brûlée and a bottle of wine from Stéphane’s gourmet curbside service? With an all-star staff from executive chef John Belleme to general manager Patrick Keenan, Stéphane’s gets our nod not only for its menu that emphasizes sustainability and hormone-free meats, but for its regular specials and service as well. This Florida institution has been owned and operated by the same family since 1949 and has never wavered in its commitment to give customers the best value for the dollar. A fire in August of 2011 brought the thriving business to an abrupt halt and forced the Studiale family to close the restaurant’s doors for nearly eight months. The restaurant — with all of its Old World charm restored — re-opened in March. In addition to a new kitchen and equipment, new booths and carpet were installed, and the false ceiling in the reception area has been replaced to show the original tongue-and-groove wood panels. But other than that, the oldest steakhouse and seafood restaurant in Broward County has resumed what it had been doing best: providing a great and varied menu and friendly and attentive service at great value. The regulars are back for the steaks and the large sides of potatoes, while newcomers are discovering the essence of the way South Florida used to be with the restaurant’s special sea bass française and steak au poivre.